A police procedural that clocks in at almost 600 pages (in trade paperback format, at least) risks being overstretched and ponderous, but R.D. Wingfield’s sixth (and final) detective Inspector Jack Frost novel obliterates that notion. Despite its multiple parallel storylines and vast supporting cast, A KILLING FROST is breathlessly paced, and as equally dark as it is humorous. It’s that rare breed of crime novel that encapsulates the entire spectrum of human emotion, where the heroes and villains inhabit a world of greys rather than black and white. Frost is under the pump. A crime wave has hit Denton – human remains have been discovered in the woods (the first of several similar finds); the local supermarket has reported poisoned stock; and two young girls have gone missing. 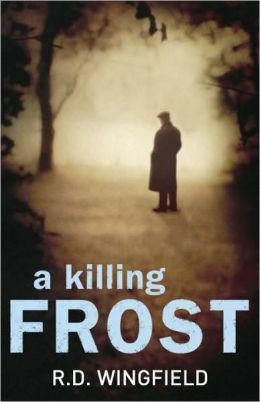 And as Frost alternates between cases, a new nemesis arrives in town in the form of Chief Inspector Skinner, whose first order of business is to arrange for the transfer of Frost: his superiors have become exasperated by his unorthodox methods and grating personality. Jack Frost is no Sherlock Holmes. He makes as many bad calls as he does right ones, often escaping down dead-end investigatory paths. He can be obnoxious, tactless and charmless – but that gruffness is merely a protective layer that safeguards his boundless dedication to justice. In A KILLING FROST he is pushed to his absolute limit, almost to breaking point. It is a worthy finale to the character and its creator, R.D. Wingfield.